Back to just a 5pt game. Vitto Brown's gaffe helps Indiana cut the lead to 60-57 with 28.6 seconds remaining. Going to come down to UW making its free throws. Koenig to the line with 25.8 remaining. Both teams in double bonus. Wisconsin leads 62-57 with 25.8 seconds to play. Wisconsin up 63-57 with 15.8 seconds to play. Ok fellas, one more stop so we can go watch the Puppy Bowl. Newkirk's 3-pointer gives him 22 points and cuts Wisconsin's lead to 63-60 with 1.3 seconds left. #Badgers 65, Indiana 60. Ethan Happ with 20 pts, 7 rebs. Nigel Hayes 15 pts, 10 rebs. Wisconsin (20-3, 9-1) own 1-game lead in the B1G. Final: #Badgers 65, Indiana 60. Happ with 20 points, Hayes with 15 points and 10 rebounds. Wisconsin finished 23-for-31 from the line, including 7-for-8 in the final 51 seconds. FINAL SCORING: Happ 20, Hayes 15, Koenig 11, Pritzl 6, Showalter 5, Brown 5, Trice 3. Hayes also with 10 rebounds. Nigel Hayes just 4-for-14, but delivered 10 rebounds (6 offensive), two assists and 7-for-8 from the FT line in 37 minutes. #Badgers story -- 65-60 victory filed. UW hit 23 of 21 FTs. Will tweet out link when I see it. Interviews shortly. #Badgers got to the line and hit far better than season average to win a close game today. Brevin Pritzl gave #Badgers 12 quality minutes. Nice ball-fake and drive and 4-4 from line. Solid D.
PPP: UW 1.02, Indiana 0.95. The #Badgers ' last four opponents: 0.85, 0.74, 0.77, 0.95. #Badgers Showalter hit a huge 3 from right corner for an 8-point lead late. Nigel Hayes on team's shooting: It doesn't look extremely well, except for Mr. Reliable (Ethan Happ) over here. "We'll learn from this film." Happ on getting the offense more consistent: I don't think it's anything we can do other than keep shooting. Prtizl on getting late minutes: I was trying to help these guys get the offense moving ... and make their jobs easier. #Badgers Hayes: hopefully we keep bringing our defense because clearly we've dropped our offense somewhere. 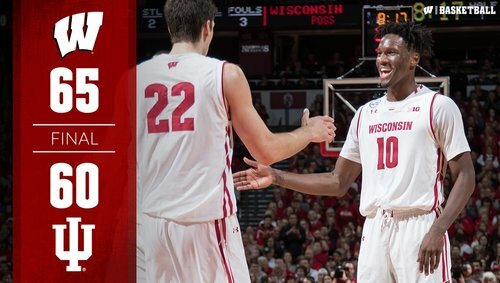 Nigel Hayes: As that number (ranking) next to your name gets smaller, the games get tougher. Hayes: "Hopefully, we just keep bringing our defense, because we dropped the offense somewhere." #Badgers Hayes 7 of 8 FTs and Happ 4 of 7 for a combined 11 of 15. Alone atop the Big Ten. ???? We are in full Waiting-on-IU's-coach mode. Tick, tick, tick. Your friendly reminder: Wisconsin hasn't lost to Indiana in Madison since 1998. The Kohl Center was only two games old. Hey @EthanHapp22 , have you been hanging out with @iverson_khalil lately...? #Badgers in last three games: 14 of 65 from 3 (21.5%) and 63 of 167 overall (37.7%). Crean: At the end of the day, a couple of possessions didn't go our way. A couple possessions went there way. Tom Crean: "At the end of the day, a couple possessions didn't go our way and a couple more went their way."